Last week, I made a very early morning run to Starbucks. It got me thinking. 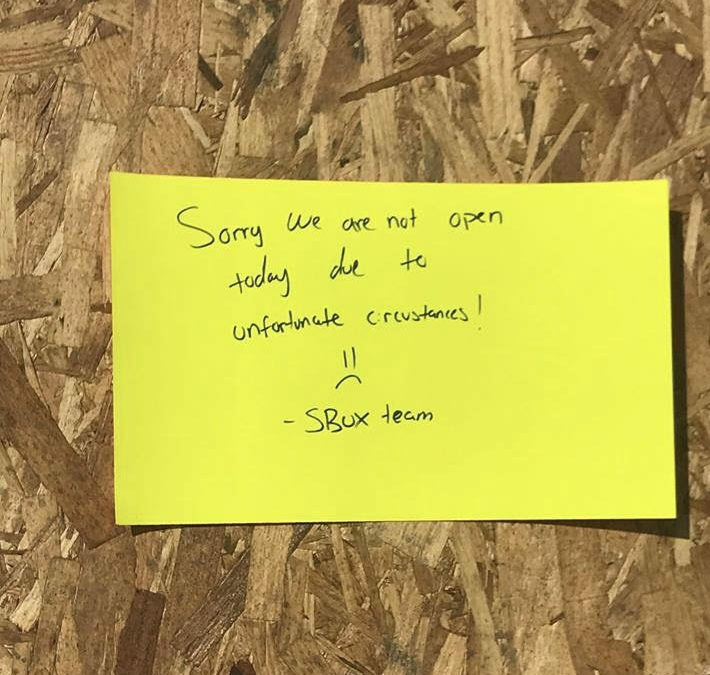 How many of us are boarded up and not open due to “unfortunate circumstances”? Maybe a relationship didn’t work out the way that we wanted it to and now we’re “guarded,” swearing we’re never going to put ourselves “out there” and risk getting hurt again. Perhaps a project that we poured our heart and soul into went belly up, and we’re telling ourselves that our dream just isn’t meant to be, making up our minds not to try again. Question: Where are there broken chunks of glass laying on the floor of your life? How much lighter would you feel if you cleaned them up? What might be possible if you were no longer boarded up due to unfortunate circumstances and open again for business?